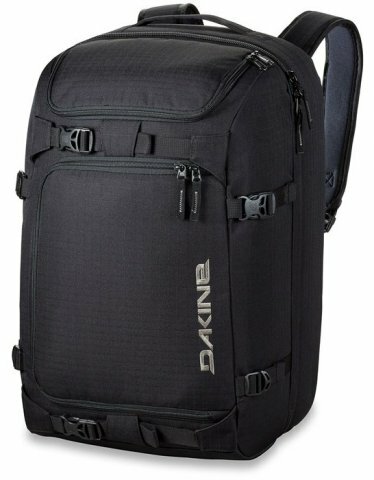 So this is the Dakine Deluxe Cargo Pack, it’s 55L and a good gear bag for those that have it dialed out and want a Bag/Pack for your gear. If you want a bag that can handle a lot more gear the Burton Rider’s bag (even though it’s 47L) is the better choice. Even more interesting the Dakine Deeluxe Cargo bag at 55L feels like it has a lower overall profile and is smaller even though it has 8 more Liters than the Riders bag. So the Riders bag packs more (probably because the boot compartment is smaller) and the Deeluxe Cargo packs better. It’s the kind of bag/pack I like to have for when I pile into a crowded car on a road trip. It also works well as a carry on bag. This combined with my Dakine Departure will handle a week without having to do laundry. We try to get as many images of the Dakine Deluxe Cargo Pack 55L, but forgive us if they're not all there.